My favorite offensive play this week was the Quarterback Counter Army ran on 2nd-and-7 from the Navy 19-yard line late in the 4th quarter. It was a huge play at a critical moment, setting up the game-sealing score. Recall the situation. Army was driving with 2:26 remaining, up 10-7. The touchdown pretty much iced it, but getting held to a field goal would’ve given the Mids hope. Also, for as much as Army had dominated the stat-line to that point, this remained a three-point game. Army never established true dominance along their O-Line. 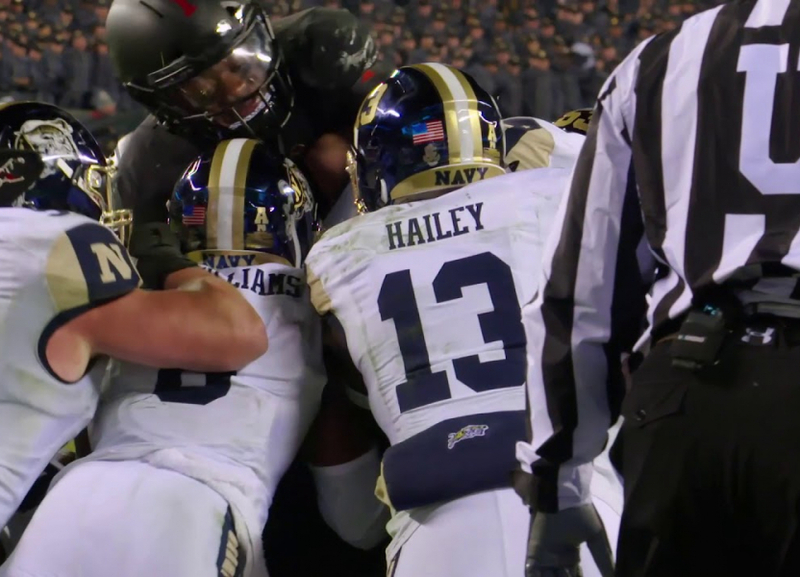 Navy’s run defense played very well throughout this game, and really, if they’d been able to get a stop here, they’d have had a legitimate shot to take the lead with a last-minute touchdown. Army got in a bunch-set with Hopkins under center. Jordan Asberry and Kell Walker were in as the slotbacks. Darnell Woolfolk set up behind Hopkins at fullback. Army had a tight end to the left and a single receiver out wide to the left as well. At the snap, Asberry motioned from left to the right. Woolfolk also took a half step to the right before crashing forward, faking the Fullback Dive. The line started blocking that way as well, setting up what looked initially to be a power run to the right coming on a pitch to Asberry. AFF fans should be familiar with this particular play. We highlighted it as our first Option Offense Play of the Week after Calen Holt scored with it just a few weeks ago against Lafayette. Navy’s defense saw the play unfolding and followed, immediately flowing upfield and towards the strong side (the right). The Mids had shown excellent pursuit all game, flowing towards the ball and stringing out pitches relentlessly. That, along with their play at the line of scrimmage, had made running tough—both in the middle and out towards the edges. This play, however, took advantage of their aggressiveness. Walker crashed down as though to block for Asberry as Hopkins took an initial step to the right. But both guards pulled around and to the left, leaving the center open. Hopkins got pressure through the gap, but now he had a wall of blockers off to his left—a tight end and both guards—with most of Navy’s defense either headed upfield through the center or back towards the would-be pitch to Asberry. Hopkins ran left and got around the corner easily, and by the time Navy’s defense got straightened out, he had a first down. In fact, he made it all the way down to the Navy 3, setting up the touchdown that iced the game. Army doesn’t run many counter plays, but the ones they do run always seem to go for big yardage. In this particular game, it seemed like they ran more reverses, and that Navy was ready for those. This play worked at least in part because it hit faster than a reverse and because it didn’t start so far behind the line of scrimmage. By contrast, Hopkins’s first touchdown run was a straight Quarterback Power play, getting both the fullback and slotback downfield as lead blockers. That worked great, but it also set up this play because it forced Navy to flow aggressively towards the strong side on almost every play afterwards. I also really liked the pitch play they ran to Woolfolk on 3rd-and-4 from their own 39-yard line early in the 3rd quarter. We’d seen this a few times to Calen Holt earlier in the season and once to Woolfolk, against either Air Force or Colgate. I could stand to see it a bit more, to be honest. Anything to keep defense honest against the Fullback Dive. They set it up like a standard Midline Option, but Woolfolk sprinted out to his left instead of attacking the line of scrimmage, getting outside the tackle-box and setting up the pitch. Hopkins pitched, and no one was looking for Woolfolk to take the ball outside. He broke a tackle, turned the corner, and then got downfield for good yardage. That set up Army’s field goal, putting the Black Knights up 10-0 late in the 3rd quarter. I’m not fond of second guessing play calling. But it has seemed to me that in the last two games, the counters have been wide open. 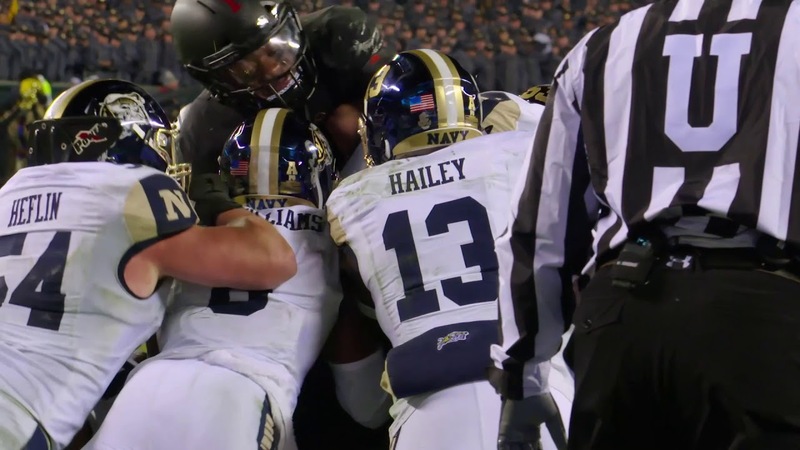 Especially Navy, where the line backers were very tight to the line, they would have to sense the counter before it happened in order to respond effectively. Running the counter a few more times may well have loosened things up for Fullback inside. I like the counter-option stuff that AFA runs. But what do I know?